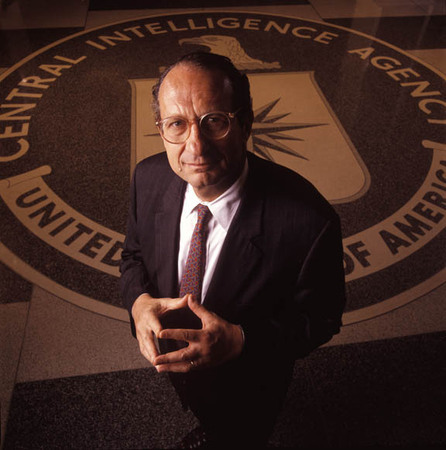 A look at Chomsky's support for the appointment of John Deutch as head of the CIA in 1995. What is particularly interesting about all this is that other anti-militarists at MIT had a rather different attitude to John Deutch because of his long-standing role as a Pentagon adviser. Deutch headed two Pentagon panels on Intercontinental Ballistic Missiles. Along with Alexander Haig, Henry Kissinger and Donald Rumsfeld, he was also an influential advisor on President Reagan's Scowcroft commission, which recommended the deployment of the MX missile in 1983. Then, when the Cold War came to an end, he became very concerned that the US military was turning away from nuclear weaponry by, for instance, removing tactical nuclear weapons from ships and submarines. MIT's student activists called him the 'War Provost'. One said Deutch's activities had 'really changed the atmosphere at MIT' and complained that Deutch's involvement made the university 'more militaristic'. These activists evidently feared that if Deutch did become MIT President, as apparently Chomsky wanted, then the university would become even more deeply involved in military research of the most barbaric kind. - Here Daniel Glenn reports that 80% of MIT's research funding came from the Pentagon. I was not aware of Chomsky's support of John Deutch and do find it surprising. As part of my activism at MIT, I was part of a protest at my 1989 graduation ceremony in which we protested the hypocrisy of the administration and faculty for wearing black arm bands in support of the student movement at Tiananmen Square. The administration had banned the distribution of the student newspapers for the first time in MIT's history, because we were publishing information about the interlocking directorships of John Deutch and other MIT administration officials and its connection to their support of military expenditures. We smuggled copies of The Thistle into the graduation ceremony under our robes that detailed those connections. And four students, including myself, unfurled banners on the stage and shook John Deutch's hand with a banner in the other that read: 'MIT War Research Kills'. The banners were in the style of the Tiananmen Square student banners. ... We did feel vindicated in our concerns about the direct line from MIT's research funding and faculty connection's to the military when John Deutch was appointed as Deputy Secretary of Defense and then CIA Director. ... I did take Noam Chomsky's course on activism and society, and we did engage with him on a number of occasions about our political efforts with the university, and his presence at the university is one of the reasons I was willing to go to MIT. I thought that if he could be there, then I could learn from that institution in spite of its deeply troubling connections to the technology of warfare. I was surprised to learn that he was limited by the politics of academia to teaching within his primary subject area of linguistics, in spite of being such an esteemed intellectual in political science. The course we took from him was not an official course in the university. I am a great admirer of Noam Chomsky, and would not want to disparage him in any way. I do find this particular issue interesting and somewhat troubling, but I do imagine that he had to make compromises of many kinds over his decades as a resident radical in an institution so entrenched in the military-industrial complex; and he its most profound and substantive critic. 1. The New York Times article (10/12/1995) also said that Deutch was reforming the CIA by reviewing its paid informants across the world so they could 'identify the crooks and the fingernail-pullers, to weigh the information they provided against their records, and to sack them if they failed the test.' The article, in other words, implied that Deutch was OK with CIA 'nail-pullers' as long as they provided useful information. 2. N.Chomsky, Class Warfare, Interviews with David Barsamian, p135-6. 3. The Washington Post, 9/12/77; New York Times, 29/3/86; B.Scowcroft, Report of the President's Commission on Strategic Forces, 1983. 4. The Washington Post, 12/3/83 and 26/12/86 and 3/12/87; Technology Review, Vol.95 (February 1992). 5. 'MIT students allege defense conflict', UPI, 2/6/89; The Tech, 27/5/88 and 24/1/90 and 2/3/90, p7. 6. It seems highly unlikely that Chomsky really wanted more military research at MIT. As he said, his attitude was more that 'whether [a university is] being directly funded by the CIA or in some other fashion seems to me a marginal question.' M.Rai, Chomsky's Politics p130. MIT's radical paper, 'The Thistle'. Hey, thanks for posting. Who is the author of this piece? 'Military Provost', Science for the People, March/April 1988, p6. Chomsky's support for Deutch is particularly puzzling when we recall how often he stressed that if military research were to take place anywhere in society, it should be in universities. See Language and Politics, p216-7. Chomsky made this argument while major student unrest was occurring at MIT. His talk was entitled 'The Function of the University in a Time of Crisis'. It is reported that radical students in the audience were 'surprised' and 'dismayed' by Chomsky's stance. When Chomsky made a similar argument around the time of the 1968 Columbia University occupation, many students were equally 'surprised'. See the Columbia Daily Spectator, 13 May 1968, p1. How utterly naiive by Chomsky. 1994 press conference at which John Deutch outlined the Pentagon's new nuclear strategies. Video can be seen HERE.